GRAND RAPIDS -- A decade back, Stuart Ray was immersed in the business of fast foods as he presided over dozens of local Burger King franchises. Today, he’s immersed in the business of human salvation, as he guides a Grand Rapids homeless shelter that is rewriting the rules of recovery and redemption. He is convinced the principles of success are the same for both. Walk through the doors of the mission and you see about what you might expect in a traditional shelter: bunk beds in a neat row, a commercial-sized kitchen and a large wooden cross that looms over its central worship area. Look a bit a closer, though, and the world changes. Residents now must furnish identification and “apply” for entrance to the Grand Rapids mission, which gains them the right to stay 30 days. Each is given their own case file. They are tested for drugs and alcohol. Each is assigned their own bed and must come each night if they are to retain their privileges. And they must look for work. Ray is quick to concede the Christian-based mission is by no means an answer for all. There are many among the homeless – the addicted, the mentally ill -- who cannot or will not live by those rules. For them, there are other shelters. “Why duplicate what someone else is doing?” he says. Indeed, Ray, who sold 42 West Michigan Burger King franchises in 2001, is wary of conventional charity. He is a deep believer in the intrinsic value of work. He thinks that to offer a man food and shelter and expect nothing in return is not only foolish – but most often self-destructive. There are numbers to back his conviction. The shelter is split into two programs, one for those able to seek work and another four-month recovery program for those with substance abuse issues. Residents have access to a computer lab for online job searches, e-mail and resume preparation. They work with a job coach for assistance in finding work. Of 159 men enrolled in the work program in 2012, 117 men were employed and 116 independently housed. That includes individuals like Dean Hickey, recently named employee of the month at a Grand Rapids plastics factory. Hickey, 51, said the mission “allowed me time to overcome my challenges and get a job. With most men, work is the measure of the man. I was out of work for 23 months. Marge Palmerlee, executive director of a nearby Grand Rapids homeless drop-in center and shelter for homeless women, believes Guiding Light Mission is redefining what a homeless shelter can be. A long-time Atlanta urban activist seconds that view. Robert Lupton is founder of FCS Urban Ministries and author of “Toxic Charity,” a book that challenges charity without accountability. He shares Ray's conviction that even such well-intended gestures as doling out free gifts at Christmas to needy families can erode dignity and self-respect. 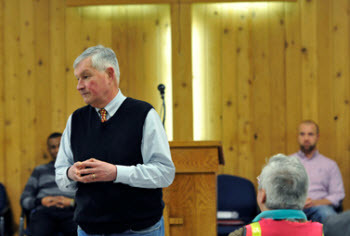 Lupton spoke at the mission's annual banquet in 2012. In the 1980s, the shelter was rocked by news reports of drug-dealing among mission residents and other irregularities. It went through a succession of directors and board turmoil as it struggled for identity and funds to support its work. Ray was hired in 2009, bringing a business sensibility and tough-love philosophy to the mission. It has a budget of $1.3 million and a staff of 15. By 2010, it installed a policy requiring men to demonstrate a good-faith effort at finding work. Residents no longer would be able to come in at night, leave in the morning, drink all day and return night after night. They would have to look elsewhere for shelter. Those staying longer than 120 days would have to demonstrate the same effort at finding housing or they would be asked to leave. “I am not a flophouse,” Ray said at the time. A graduate of Hope College, Ray and his wife, Anne, have three grown children. He is fond of taking neighborhood walks and reading, particularly the works of Palmer Parker, an author, educator and activist who focuses on issues in education, community, leadership, spirituality and social change. He is an elder at Westminster Presbyterian Church in Grand Rapids and active in numerous nonprofit organizations, including the Grand Rapids Area Coalition to End Homelessness. Looking back, Ray admitted he wasn't sure how all this would play out. I've had the opportunity to take a close look at how the shelters in Gaylord and Traverse City operate. With the exception of the religious component, the programs they offer are very similar to this Grand Rapids facility. I suspect most shelters operate this way. What the article doesn't address is the elephant in the room, funding. In one way or another, most funding for homeless shelters are originally sourced from federal and state governments. Those funds are drying up. The working poor, some of whom live in shelters, got hit hard in Michigan with the reduction in the earned income credit. Donations to shelters and food banks took a big hit when the Michigan tax credit for donators was eliminated. It's a miracle that some of these places manage to stay open and frankly, I suspect some (maybe several) will close this year simply because they don't have the funds necessary to operate. Guiding Light Mission is a 501(c)3 not for profit. They do not receive government funding and rely heavily on private donations. From what I understand, Guiding Light is funded through donors and not the government. At least that is what they said on the tour. Way to go Mr. Ray! Its almost biblical in its simplicity, "give a man a fish VS teach a man to fish" now if we can replicate this wisdom on a national level! As a board member of Guding Light I assure you we receive no state or federal funding and speaking for myself, as a board member, we would NOT be interested in receiving such funds becasue those funds would restrict us from effectively managing the mission because the outcome tied to such funding would be so unrealistic.